Holds up to 16" dia.x17"W spools. 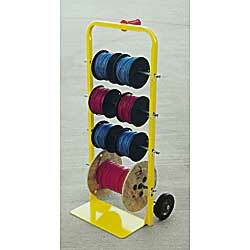 Includes 1/2" zinc-plated solid steel axles, heavy-duty plastic coated handle, and 6" rubber tires. FOB CALIFORNIA. 3/16" steel toe plate. 21"W x 16"D x 43"H overall. 24"W x 22"D x 43"H overall.